A neighborhood welcome: Ambulatory care center features an inviting, functional environment. 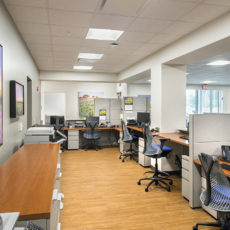 Healthcare delivery’s recent evolution has included an increase in ambulatory care centers, allowing patients to access services close to home. For a new center in a growing community, OfficeWorks helped create an environment that is welcoming to visitors and supportive of caregivers. The client’s goals included providing a welcoming atmosphere, starting with the large, shared reception area. Seating choices like café tables and serpentine couches in harmonizing patterns delineate the space and provide variety. “It’s an inviting lobby that makes people feel comfortable, not like they’re sitting at a bus stop,” said Kristen. The center provides a variety of services—primary care, immediate care, imaging, laboratory and physical therapy. 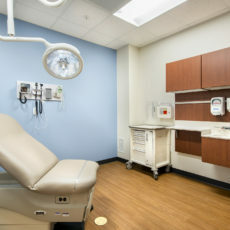 The nature of healthcare makes the design and selection of furniture and casework critical. 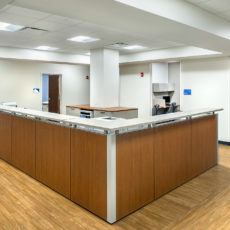 Nurse stations and exam rooms need to foster visibility and efficiency. And given ever-changing treatment and processes, flexibility is a must. Throughout the facility, OfficeWorks specified modular casework that can change as needs evolve. “OfficeWorks hit the mark in terms of what we needed clinically and what the outcome looks like in furniture and systems,” Kristen said. Delivered through the design/build method, the project called for collaboration and early involvement by all team members. “We partner with OfficeWorks in the beginning stages of design, connecting them with the architect so they can lead the design of our furniture solutions,” Kristen said. 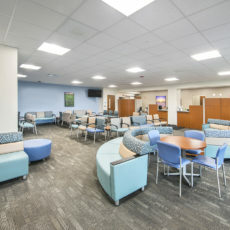 The process included regular meetings between the design team and contractor to determine what each construction trade needed, as well as multiple on-site coordination visits to move the project forward.